Cleopatra Entertainment has announced the home video release of DEVIL'S DOMAIN, starring Michael Madsen, Sticky Fingers, Fred Rose, Rene Nezhola (STORAGE WARS) and featuring the music of Iggy Pop, DMX, The Onyx, and more. The film is currently available on all VOD platforms, and will be released on DVD and Blu-Ray July 11th. DEVIL'S DOMAIN is a new-age horror film centered on a cyber-bullying incident at a fictional high school that goes terribly wrong. The victim then seeks her own unique form of revenge, albeit with some super-natural help along the way. 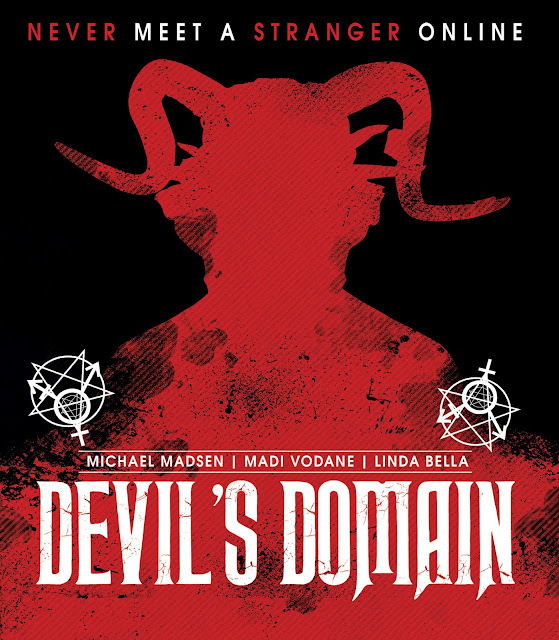 DEVIL'S DOMAIN was written and directed by Jared Cohn (THE HORDE, WISHING FOR A DREAM, THE DOMICILE) and was produced by David Sterling. Brian Perera is Executive producing with Tim Yasui co-producing for Cleopatra Entertainment. "Devil's Domain is a story about the ramifications of social media, cyber-bullying and how it affects the youth of today," said director Cohn. Cohn has also been tapped to write and direct the upcoming Cleopatra project STREET SURVIVORS, based on the ill-fated 1977 plane crash that took the lives of several of the Lynyrd Skynyrd band members and crew as seen thru the eyes of Artimus Pyle, the band's drummer at the time and one of the surviving members of the plane crash.